A strip from Hubert's comic. Lucy Gellman Photos. A meteor has hit the New Haven Green. Rocks and grass are flying through the air; flames lick the space’s central fountain and flagpole. Smoke is everywhere. And any humans on site—stopping with their skateboards, running for their buses—are transforming into aliens by the second. They’ve got black, glassy eyes, green skin, and slimy tentacles erupting from their sides. Only one New Havener, a woman named Genesis, doesn’t seem to be affected. 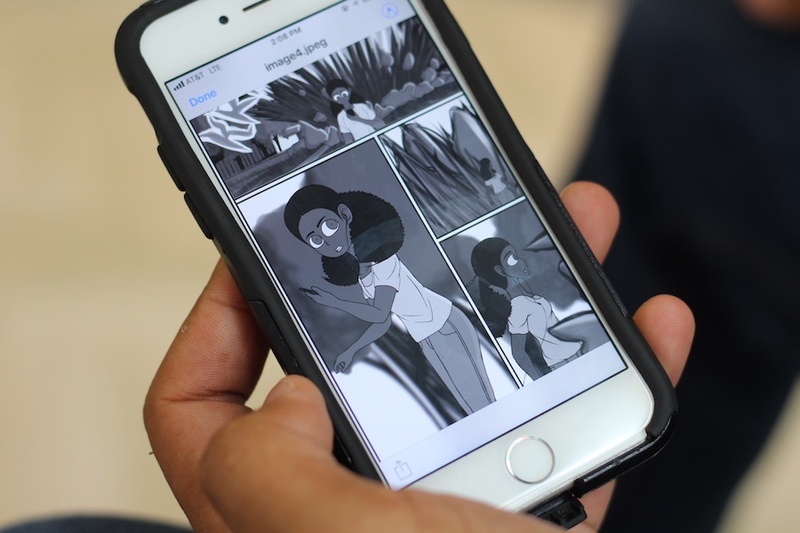 That’s not the latest news on the Green, but Kaleo Hubert’s vision for “Star Storm,” a new comic strip that puts New Haven front and center, and tells its story through a Black woman’s eyes. With 10 other high school students, Hubert is one of this year’s Public Art Fellows (PAF) with Site Projects, Inc., a nonprofit that supports and funds public art in New Haven. After working for six weeks weeks with graphic artists Rob Greenberg, Matt Stevens and Amie Ziner, all 11 fellows will have a final exhibition and reception this Sunday at the Ely Center of Contemporary Art. Festivities run from 2 to 6 p.m. and are free and open to the public. More information is available here. 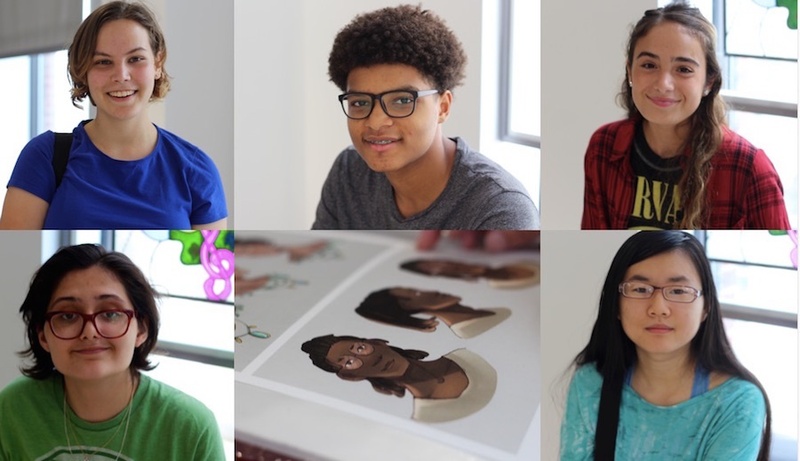 From top left: Jessica Edwards, Kaleo Hubert, Hannah Marcano, Mi Nawabutsitthirat, a character sketch of Edwards', and Arrie Lopez. The program, now in its second year, has been meeting three days a week since late June at the New Haven Free Public Library (NHFPL). Inside the library, Greenberg has encouraged fellows to use the local history reading room to discover “what made New Haven magnificent,” Outside the library, fellows have gone on hyper-local “monument” walking tours, stopping at the New Haven Green, Amistad Memorial beside City Hall, Felice Varini’s Square With Four Circles, Soldiers and Sailors Monument, Claes Oldenburg’s Lipstick Ascending, wheat paste murals by the artist Swoon, and underpasses that have been transformed by public art. 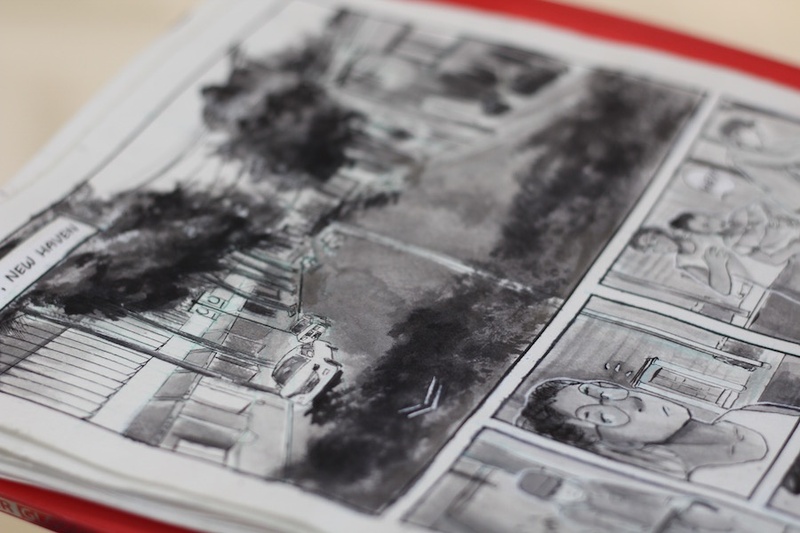 Wednesday, a handful of fellows looked over final touches on their projects, multi-paneled comics that include city landmarks, portraits of New Haven’s neighborhoods, and vibrant protagonists of color. In one, a fluffy Siamese cat plays freely on Maya Lin’s Women’s Table, splashing its owner with cold water as it rolls around and gets its paws wet. The owner leans over the table, examining sequenced, tiny numbers etched on its granite surface. A rising freshman at Wesleyan, Mi Nawabutsitthirat said that she was inspired by her own experience with the sculpture, which she first encountered with a group of friends close to midnight. A self-described recovering “shut-in,” Nawabutsitthirat immigrated to New Haven from Thailand when she was seven, ultimately attending Wilbur Cross High School. For most of school, she kept to herself. But that changed two years ago, when she started coming downtown after school and on the weekends. It was on one of those recent excursions that she first saw and touched the Women’s Table, a moment that inspired the comic. In real life, Nawabutsitthirat said she was surprised by the cool wetness of the granite, and realized only later that it was okay to touch it. 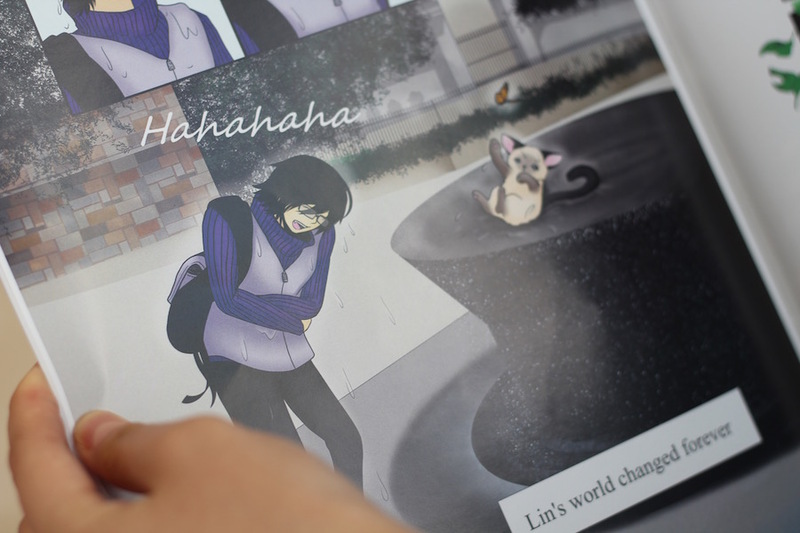 In the strip, a student affectionately named Lin spends all of her time studying inside her New Haven home—until she and her cat head to Yale’s Rose Walk. The cat plays on the sculpture, getting Lin to take a closer look. In a glance, it opens up her world, inspiring her to study outside on the university’s old campus with a friend. Other fellows steered clear of Yale, pulled instead toward New Haven’s ephemeral street art. In Jessica Edwards’ Han & Van, two teens who have been raised in the city bond in front of Swoon’s Dawn and Gemma, a wheat paste mural on Chapel Street that was power washed into oblivion earlier this month. In pen and ink wash, the two come alive on the page, walking the streets and looking at the mural with inquisitive eyes. When it disappeared earlier this month—a byproduct of Site Projects’ four-year contract with the building owners, which started in 2014—Edwards realized that she had unwittingly become part of the work’s history. She said that she’s bringing what she learned in the course to her college applications, with the intention of studying graphic design and psychology. So did Arrie Lopez, an ESUMS grad who is now a rising freshman at Southern Connecticut State University (SCSU). 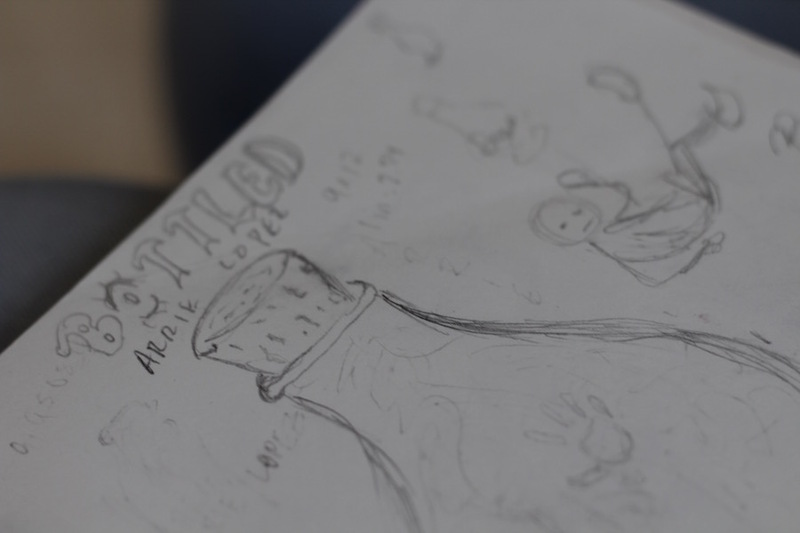 Born and raised in New Haven, they drafted a comic called “Bottled,” in which the main character discovers that she’s a genie when a car runs right through her. After “I did my research,” Lopez also made the character hijabi, noting that they don’t see enough representation of women or Muslims in comics. Others took the opportunity to make a statement. Hannah Marcano, a rising senior at Career Regional High School, said she grew up hearing negative stereotypes about the city she called home. She saw the final project as a chance to put them to rest. In her cartoon (pictured below), a couple takes a vacation to New Haven, traipsing around downtown and taking in its public monuments. At first, one partner is cranky: he doesn’t like the big city, and thinks there’s something off about it. New Haven beckons warmly all around him. By the end of the day, the city has won him over. That was also the case for Hubert, a rising senior who is starting at Cooperative Arts & Humanities High School after the city’s Board of Education voted to close Cortland V. Creed High School in May. Inspired by a mix of Japanese manga, Pokemon, and Yale’s secret societies, he devised a Science Fiction drama in which aliens invade New Haven and take over its streets, monuments, and public art projects. The city’s only hope is Genesis, a New Havener with big, curly hair and a genetic resistance to the mutation, like a modern day Henrietta Lacks. As he worked on the comic, he said PAF teachers taught him how to draw more consistent scenes, rendering Genesis the same each time. Meanwhile, he said he thought about how badly comics needed more protagonists like her—strong, unassuming women of color who weren’t stereotyped, or relegated to the sidelines. The Public Art Fellows will hold their final reception this Sunday, Aug. 26, from 2-6 p.m. at the Ely Center of Contemporary Art. More information is available here.